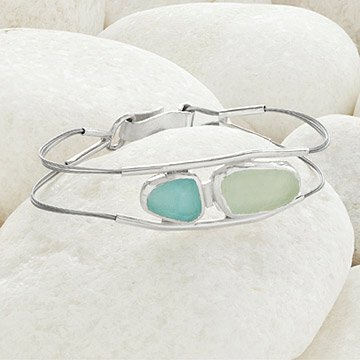 Remember beach combing adventures and your favorite spots by the sea with this shimmering sea glass bracelet. This elegant clasp bracelet is built around two "pebbles" of sea glass--discarded glass that is shattered, shaped and smoothed by the ocean before washing up on the beaches of Hawaii, where Gillen seeks it out and collects it. The rounded, organic shapes are framed in handcrafted sterling silver, and suspended from flexible clusters of silver wire. The reflective silver makes the translucent glass catch the light, almost glowing from within. A beautiful collaboration of human ingenuity and forces of nature, each piece has unique variations in shape and color. Handmade in Maryland. Occasional cleaning with a soft polishing cloth. It is a nice piece but it would have been nice to have had the option to get a smaller one. My wife is small and the bracelet slips off. Gorgeous, delicate, makes me almost smell the salt water! These match a unique sea glass necklace I got as gift from my hubby. It's hard to match sea glass, but this was dead on! I bought this bracelet for my mother-in-law. She absolutely loves it! She actually went out and bought a new outfit just to match her new bracelet! It's elegant and classy, yet simple and earthy all in one. Great workmanship. This bracelet is beautiful, it fits amazing. A sterling clasp of a bracelet! This sea glass bracelet was given to a granddaughter for her 21st. birthday...a beautiful reminder of where her roots are while she attends college inland.